It’s Tuesday afternoon, you’re thinking about what to make for dinner, and you’re stuck. You want something a little different from the usual, something fresh yet satisfying, and something that you can prep and cook in a half hour or so. 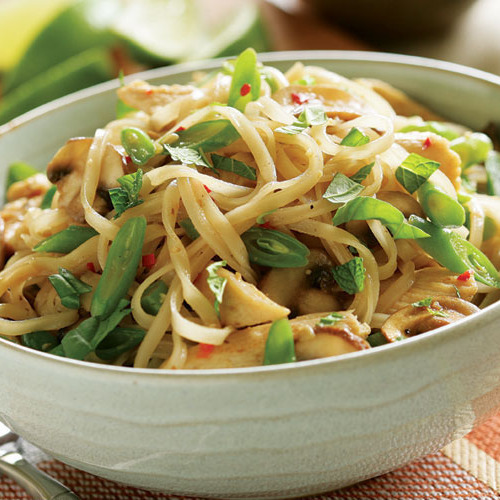 For the answer, look no further than rice noodle stir-fries. 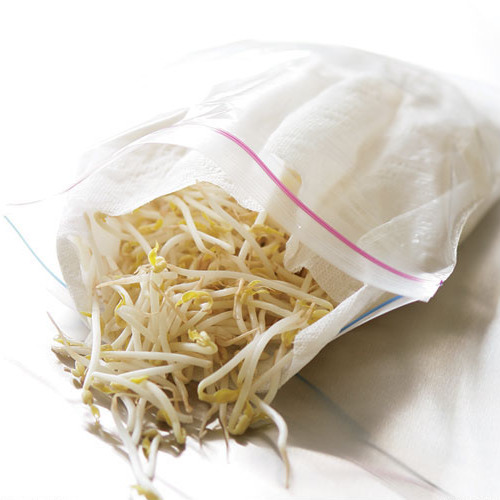 If you’ve eaten at Thai restaurants, you’ve probably gotten a taste of these wonderful dishes—a mound of slightly transparent noodles tossed with chicken, shrimp, or tofu, vegetables like green beans or bean sprouts, and salty, tangy, and spicy condiments like fish sauce, vinegar, and chiles. 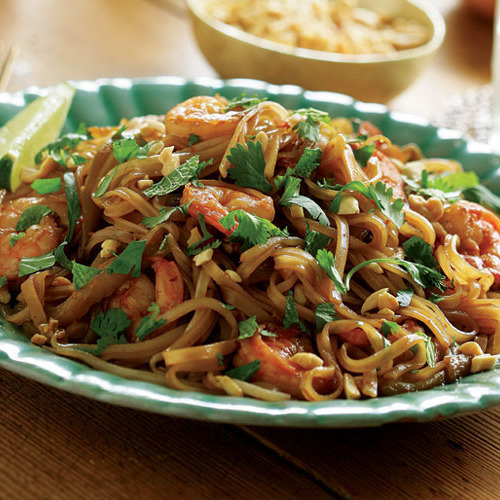 The most famous rice noodle stir-fry of all time has to be pad thai, but there are countless others. Once you try one of the recipes in this article, you’ll discover that the method is dead simple. 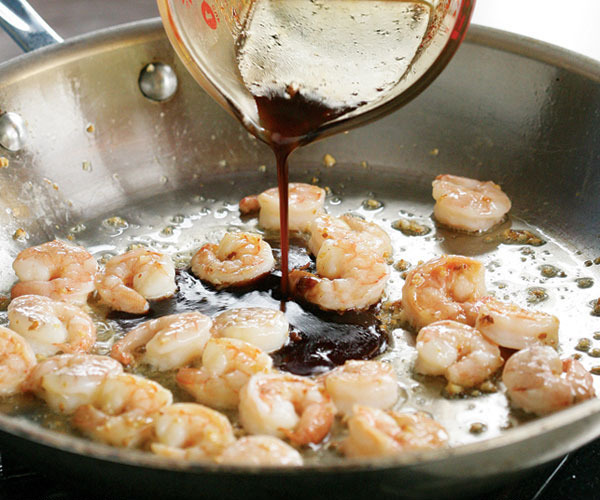 You don’t need a super high-powered wok burner; you don’t even need a wok. 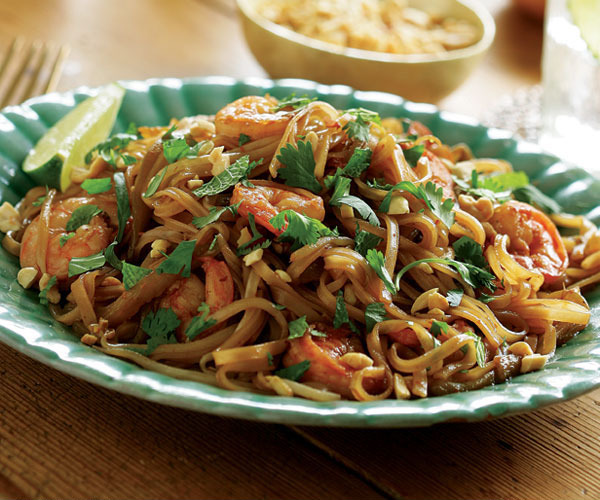 And even though Thai noodle dishes in restaurants often include hard-to-find ingredients like bamboo shoots or Thai basil, you won’t need them for these recipes. Your local supermarket should have everything you need. 1. Submerge wide (pad thai) rice noodles in a bowl of very warm (110° F) water and soak until they’re pliable but still rather firm, about 30 minutes. Drain in a colander (no need to pat dry). 2. 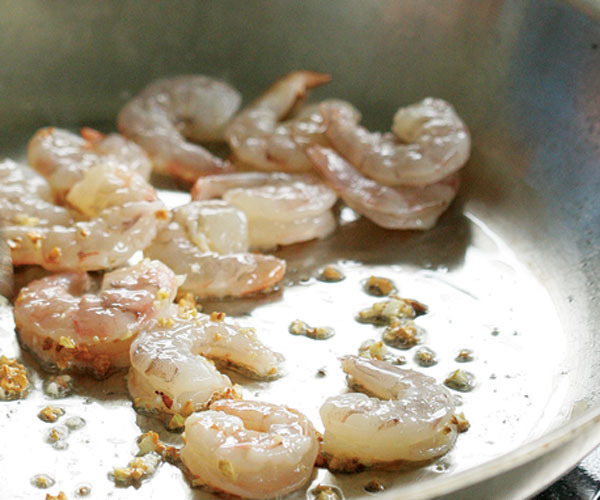 After adding minced garlic to the pan, give a quick stir and then immediately stir in shrimp or meat. The garlic will quickly turn golden and aromatic-don’t delay or you risk it turning bitter and black. 3. Condiments like fish sauce and soy sauce go in next. Also add any ingredients that need a few minutes to soften. 4. Stir in the drained noodles toward the end. They only need a minute or two over the heat to finish cooking. They should be tender, silky, and slipper (but not muhsy). 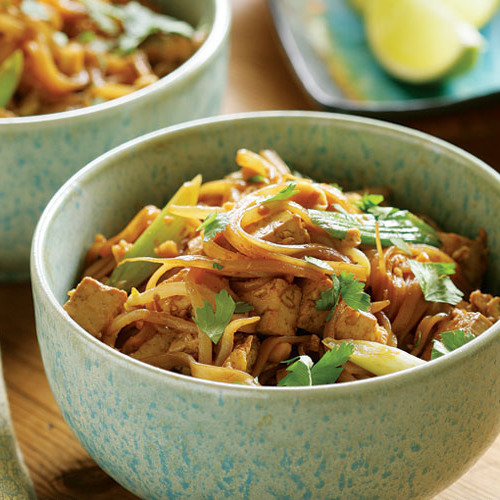 You don’t need to stock up on exotic ingredients to make these dishes. 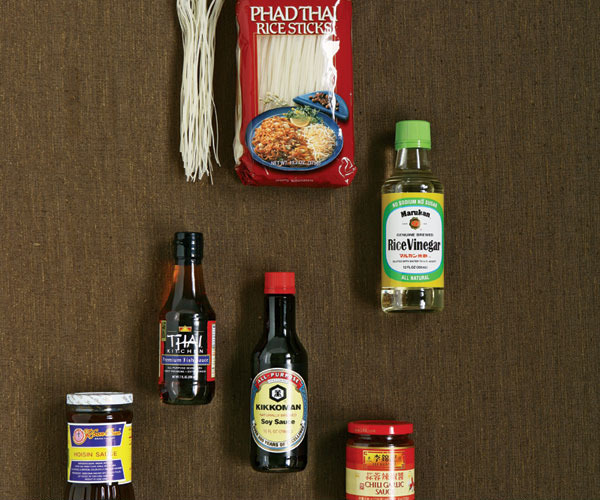 With the noodles and a few condiments in your pantry, you’re halfway there. 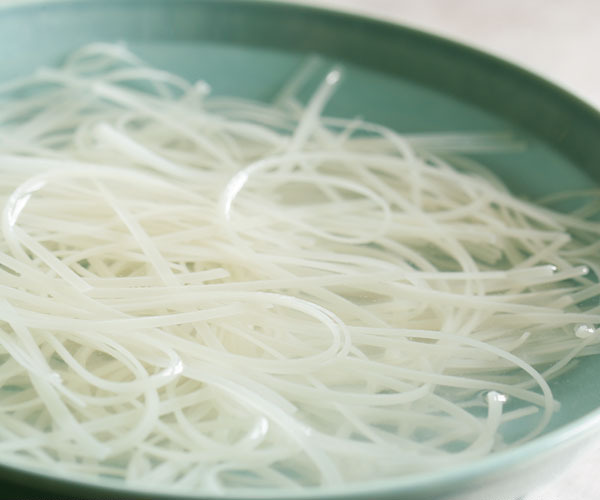 Rice noodles: The recipes here call for wide rice noodles, often labeled pad thai noodles or rice sticks they resemble linguine or fettucine. They come in various-size packages; if you don’t have a scale, divide the package by eye to get the amount needed. 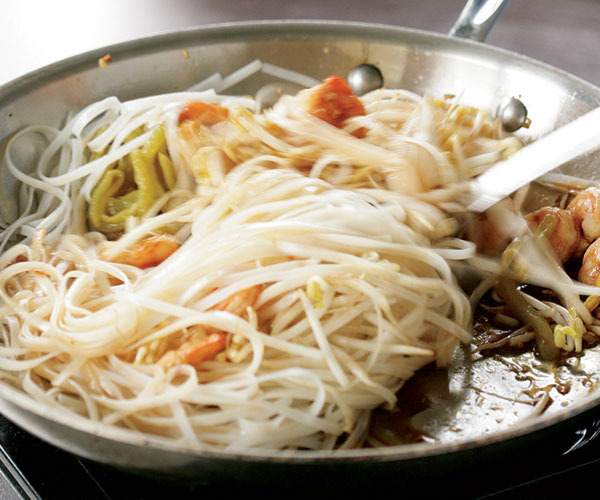 Figure that 4 ounces of wide noodles yields about 2 cups when cooked, enough for two people. Fish sauce: Good fish sauce should be the color of tea and have a slightly briny taste. Refrigerated, it keeps for months; when it turns dark or crystallizes, discard it. Rice vinegar: Use unseasoned rice vinegar, which has a sharp, clean taste. It keeps indefinitely. Hoisin sauce: This dark, thick, sweet sauce consists of soy beans, salt, sugar, and flour. At room temperature, it lasts forever. Soy sauce: I like Chinese soy sauce for these dishes, but you can use your own favorite. Soy sauce lasts indefinitely in the refrigerator. Chile-garlic sauce: These vary in strength, so you may want to adjust the amount accordingly.